Everyone needs basic computer skills to function in today's job market. These basic skills include the ability to use common application programs such as word-processors, spreadsheets, database programs, and presentation software. Additionally, the use of email and familiarity with internet etiquette are becoming basic requirements for most jobs. Today over 80% of all business communication is done through email including sending resumes and cover letters, scheduling interviews and even following up after interviews. This means, stay away from abbreviations and don't use emoticons (those little smiley faces). Don't use a cute, offensive or suggestive email address for business communications. 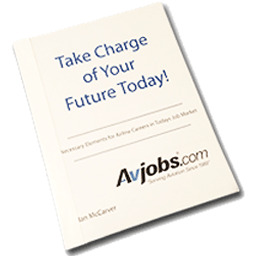 Avjobs provides applicants with a professional private aviation email address. Use a dictionary or a spell checker - whichever works better for you. While you can write in a conversational tone (contractions are okay), pay attention to basic rules of grammar. We recently reviewed an article titled "AOL Email Address Brands You As Technologically Obsolete." The article said that having an outdated email address from a company like AOL brands a person as being someone who is not willing to move forward with technology. The article specifically discussed people looking for a job and how an employer might question a candidate's suitability for the job simply because of the email address he or she uses. When we receive business email that is using one of these free services we (and every other recruiter and hiring manager) - correctly or not - make some basic assumptions. Our first assumption is this person is not really serious about building or marketing themselves as a serious applicant—at least not in the aviation sector. Second, while they may be serious, they just don't understand how to keep up with today's technology changes and improvements, or what that email address is really saying about them. Every communication leaves an impression. Your email address is your front door. Emails you send to employers and hiring managers invite them to come to your “office” (your presence) to read your resume and learn more about what you have to offer as an employee. You may question our inclusion of Gmail on this list. We have several Gmail addresses. But we don't use them for business purposes or as our primary email address. Gmail works well as an email client to manage your incoming email. It works very well for lots of people. Just don't send employers a message from your Gmail account if you want them to really pay attention to it. There is simply no reason not to have a unique email address that reminds people about your interaction and commitment to the aviation industry. And every time you send an email from your myavjobs.com email account, you're encouraging people to view your resume, accomplishments and value in the aviation industry.